U.S. public high schools have reached a milestone, an 80 percent graduation rate. Yet that still means 1 of every 5 students walks away without a diploma. Citing the progress, researchers are projecting a 90 percent national graduation rate by 2020. Their report, based on Education Department statistics from 2012, was being presented Monday at the Building a GradNation Summit. The growth has been spurred by such factors as a greater awareness of the dropout problem and efforts by districts, states and the federal government to include graduation rates in accountability measures. Among the initiatives are closing "dropout factory" schools. In addition, schools are taking aggressive action, such as hiring intervention specialists who work with students one on one, to keep teenagers in class, researchers said. Growth in rates among African-American and Hispanic students helped fuel the gains. Most of the growth has occurred since 2006 after decades of stagnation. "At a moment when everything seems so broken and seems so unfixable ... this story tells you something completely different," said John Gomperts, president of America's Promise Alliance, which was founded by former Secretary of State Colin Powell and helped produce the report. The rate of 80 percent is based on federal statistics primarily using a calculation by which the number of graduates in a given is year divided by the number of students who enrolled four years earlier. Adjustments are made for transfer students. In 2008, the Bush administration ordered all states to begin using this method. States previously used a wide variety of ways to calculate high school graduation rates. Iowa, Vermont, Wisconsin, Nebraska and Texas ranked at the top with rates at 88 percent or 89 percent. The bottom performers were Alaska, Georgia, New Mexico, Oregon and Nevada, which had rates at 70 percent or below. Idaho, Kentucky and Oklahoma were not included because these states received federal permission to take longer to roll out their system. The new calculation method allows researchers to individually follow students and chart progress based on their income level. By doing so, researchers found that some states are doing much better than others in getting low-income students or those who receive free or reduced lunch meals to graduation day. Tennessee, Texas, Arkansas and Kansas, for example, have more than half of all students counted as low income but overall graduation rates that are above average. In contrast, Minnesota, Wyoming and Alaska have a lower percentage of low-income students but a lower than average overall graduation rate. 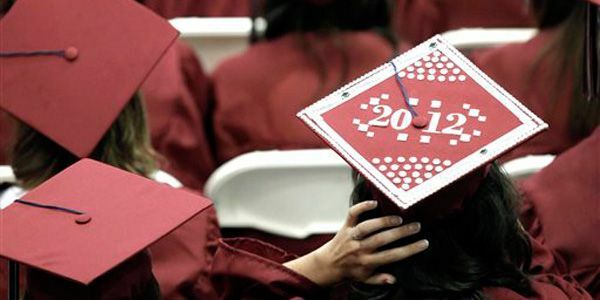 Graduation rates increased 15 percentage points for Hispanic students and 9 percentage points for African American students from 2006 to 2012, with the Hispanic students graduating at 76 percent and African-American students at 68 percent, the report said. To track historic trends, the graduation rates were calculated using a different method. Also, there were 32 percent fewer "dropout factories" schools that graduate less than 60 percent of students than a decade earlier, according to the report. 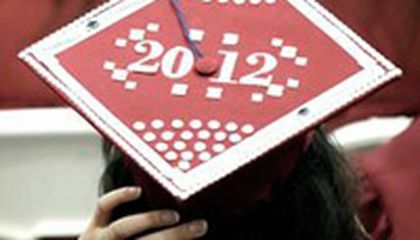 In 2012, nearly one-quarter of African-American students attended a dropout factory, compared with 46 percent in 2002. About 15 percent of Hispanic students attended one of these schools, compared with 39 percent a decade earlier. There were an estimated 1,359 of these schools in 2012. Robert Balfanz, a researcher with the Everyone Graduates Center at the School of Education at Johns Hopkins University who was a report author, said some of these schools got better. Other districts closed these schools or converted them to smaller schools or parents and kids voted with their feet and transferred elsewhere. If the graduation rate stayed where it was in 2001, 1.7 million additional students would not have received a diploma during the period, Balfanz said. "It's actually a story of remarkable social improvement, that you could actually identify a problem, understand its importance, figure out what works and apply it and make a difference," Balfanz said. In New Hampshire, where the graduation rate is 86 percent, Anne Grassie, a state representative and former longtime member of the Rochester School Board, cites a change in state law in 2007 that raised the dropout age to 18. In Rochester, she said there have been numerous initiatives such as programs that allow students who fail classes to begin making them up online or after school instead of waiting for summer school and an alternative school for at-risk students. "We pay more attention to just making sure there's an adult to connect with every child, so they know someone's there for them," Grassie said. "I think those kinds of initiatives have a lot to do with kids staying in school, but it's a combination of things. It's not really one thing." Don't forget California. With 13 percent of the nation's schoolchildren and 20 percent of low-income children living in California, the state must continue to show growth. The state's overall rate was 79 percent compared with 73 percent for the state's low-income students. Improve outcomes for special education students. Students with disabilities make up about 15 percent of students nationally but have a graduation rate 20 percentage points lower than the overall average. The rate for students with disabilities varies by state, with a rate or 24 percent in Nevada and 81 percent in Montana. Focus on closing racial and income gaps. Think big cities. Most big cities with high concentrations of low-income students still have graduation rates in the 60s or lower, the report said. In addition to America's Promise Alliance and Balfanz's center, the report was produced by the public policy firm Civic Enterprises and the education group Alliance for Excellent Education. I think more students should graduate. It's very important to graduate because it uses a lot of your brain. It tests your ability. You need a diploma to do a lot or things in life. I think that if one out of every five students do not graduate is pretty depressing. But at least the statistic percentage will increase by 10% by the year 2020. Maybe the graduation percentage could eventually increase to 95%. It'll really help if they get this higher. It will give more people jobs and help them with raising a family in the long run by them having a job that pays well. This is actually pretty cool seeing more kids graduate instead of kids just being lazy and quitting. We will have more educated people out there in the so called real world which is referred to as the working environment. I think that the 4 out of 5 statistic is a good one but at the same time it's kind of sad that 20% of high school students either don't graduate or drop out. But on the other hand it's a good stat because the majority of the students are graduating. I am going to be in that 80% when I am in high school. I'm so glad that this beautiful country that i live in is finally doing better academic wise.An 80 percent graduation rate Is phenomenal , since researches are projecting a 90 percent national graduation rate by 2020 it wont be long till almost every student across the country is graduating with a high school diploma. Where just one step closer to making it to the top as a country. I am so happy to see the number of high school students graduating. I plan on graduating and going to, and college. I hope many other students have that ambition to do the same. I think it is cool that 4 out of 5 students graduate from high school but means that 1 student does not receive a diploma and is probably going to drop put or repeat that grade. I think that the school should encourage students to pass their grade and graduate so the students can get a job or be something instead of being called a drop out. Studies show that u.s pubic rate of high school students graduating is lower. Its now down to 80 percent of the kids. This research was done in 2012. If your wondering why , kids tend to dropout due to pregnancy. Or maybe stress or certainly just because they don't like school.